Statement by the Liberal Party of Canada - Trudeau meets the Aga Khan 2015-05-28 | Ismaili.NET - Heritage F.I.E.L.D. 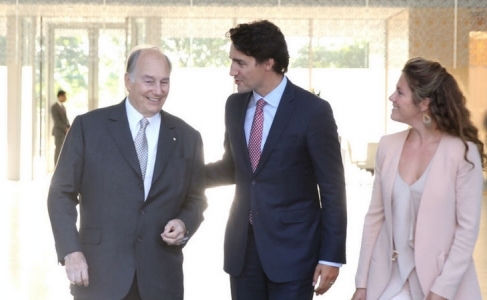 The Leader of the Liberal Party of Canada, Justin Trudeau, and his wife, Sophie Grégoire-Trudeau, meet with his Highness the Aga Khan at the new Delegation of the Ismaili Imamat in Ottawa. “It was a great honour and privilege to once again meet with His Highness the Aga Khan and other Ismaili community leaders last night at the new Delegation of the Ismaili Imamat in Ottawa. “For more than 50 years, the Aga Khan has been a global humanitarian leader, working tirelessly to reduce poverty, promote pluralism, and improve health and education outcomes in developing countries. He remains a beacon of acceptance and compassion, and an inspiration to both his community and the world.